Home » What are Executive Clocks? 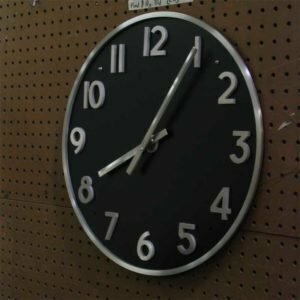 An Executive Clock is a name given to a silhouette clock or gallery clock, typically installed in a boardroom or an executive office. Typically our Style 1000 or Style 1100 tower clocks, or our 40900 gallery clocks can be used in this application. The term is used to denote a formal, often interior, setting for the clock. Style 1000 Interior Executive Clock with Face Style “P” dial markings and hands “CS”. © 2019 Electric Time Company. All Rights Reserved.